Joe Pigott's stunning strike rescued a point against Accrington Stanley and saw Newport County move into the League Two play-off places. Accrington took the lead when Sean Maguire's deflected shot beat Joe Day. But Newport, who had won their three previous games, equalised in spectacular fashion 10 minutes later. On-loan Charlton striker Pigott's curling effort from 30 yards extended County's unbeaten run to four games. "I didn't think we were as fluid as we have been and I thought we started slow but then got a grip of the first half and ended strongly. "But again we didn't go out and start how we finished the first half and it seemed like everything was running away and the passing was a little bit loose. "It was very frustrating as an afternoon but sometimes you have to give the opposition credit." Match ends, Newport County 1, Accrington Stanley 1. 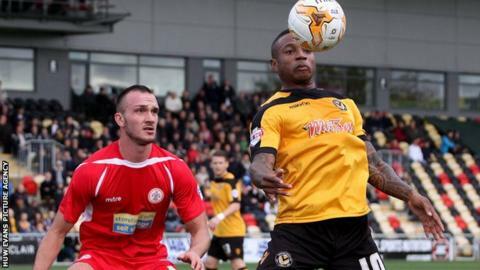 Second Half ends, Newport County 1, Accrington Stanley 1. Attempt saved. Yan Klukowski (Newport County) header from the centre of the box is saved in the top centre of the goal. Attempt saved. Mark Byrne (Newport County) right footed shot from outside the box is saved in the top centre of the goal. Substitution, Newport County. James Loveridge replaces Aaron O'Connor. Attempt saved. Marcus Carver (Accrington Stanley) right footed shot from the centre of the box is saved in the bottom right corner. Corner, Accrington Stanley. Conceded by Kevin Feely. Luke Joyce (Accrington Stanley) wins a free kick in the defensive half. Corner, Newport County. Conceded by Shay McCartan. Joe Pigott (Newport County) wins a free kick in the defensive half. Goal! Newport County 1, Accrington Stanley 1. Joe Pigott (Newport County) right footed shot from outside the box to the high centre of the goal. Assisted by Lee Minshull. Attempt saved. Shay McCartan (Accrington Stanley) right footed shot from the left side of the box is saved in the bottom right corner. Shay McCartan (Accrington Stanley) hits the left post with a right footed shot from the left side of the box. Substitution, Newport County. Yan Klukowski replaces Max Porter. Goal! Newport County 0, Accrington Stanley 1. Sean Maguire (Accrington Stanley) left footed shot from the left side of the box to the bottom right corner. Assisted by Luke Joyce. Substitution, Newport County. Joe Pigott replaces Chris Zebroski because of an injury. Corner, Accrington Stanley. Conceded by Joe Day. Attempt saved. Luke Joyce (Accrington Stanley) right footed shot from outside the box is saved in the top left corner. Attempt missed. Shay McCartan (Accrington Stanley) left footed shot from the left side of the box is high and wide to the left. Corner, Accrington Stanley. Conceded by Andrew Hughes. Kevin Feely (Newport County) wins a free kick in the defensive half. Andy Sandell (Newport County) wins a free kick on the right wing. Substitution, Accrington Stanley. Marcus Carver replaces Lee Molyneux. John O'Sullivan (Accrington Stanley) wins a free kick on the left wing. Attempt missed. Sean Maguire (Accrington Stanley) right footed shot from outside the box is too high.